KIEV, Ukraine -- Ukraine's free-trade deal with the EU comes into effect Friday, coinciding with the start of Moscow's food embargo against Kiev that will force the impoverished former Soviet republic to revisit its economic model. 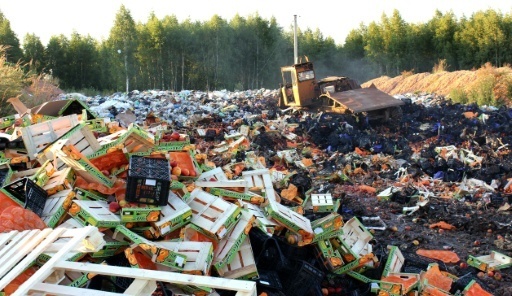 EU-Ukraine trade deal comes into force, angers Moscow who is seen here, destroying Western goods. The free-trade accord is part of the broader EU Association Agreement -- signed at the end of June 2014 -- and stands at the heart of the drastic deterioration of Ukraine's relations with Russia, furious at seeing its Soviet-era satellite turn to the West. Ukraine, whose market has been traditionally oriented toward Russia, will now have to turn itself toward the European market and abide by its rules. "The agreement will contribute to the modernisation and diversification of the Ukrainian economy and will create additional incentives for reform," the European Commission said in a statement on Thursday. Brussels also said the deal would help Ukraine improve its business climate and attract foreign investment, a view shared by Yegor Perelygin, an analyst at UniCredit bank. The road to Ukraine's adoption of the deal has been peppered with obstacles. In November 2013, Ukraine's then pro-Kremlin president Viktor Yanukovych rejected the association agreement, triggering pro-European protests that led to his downfall and eventually to the armed conflict in eastern Ukraine, which has left more than 9,100 people dead. Fearing the deal could see its market flooded with European goods, Russia has taken retaliatory measures, suspending its free-trade agreement with Ukraine and banning the import of Ukrainian food starting on Friday. Prime Minister Arseny Yatsenyuk has put the cost of Moscow's measures to his country at some $600 million. President Petro Poroshenko admitted earlier this month that Russia's retaliatory move would cause "damage" to Ukraine's economy but said he was "ready to pay the price" and press on with efforts to join a European Union free-trade zone. He blasted the embargo in his New Year address, saying Moscow was trying to "economically strangle" Ukraine. "Moscow closing its market to Ukrainian merchandise, a powerful economic attack, is another part of the war (...) against us," Poroshenko said. Kiev has vowed to strike back with its own measures and is expected to announce a list of banned Russian products in the near future. Ukraine mostly exported agricultural products, vegetables, fruit, dairy and sweets to Russia, with the countries' trade ties shrinking by 70 percent compared to 2011, according to Russia's deputy minister of economic development Alexei Likhachev. "This (the Russian embargo) will of course be a problem for Ukrainian food producers, but let's not forget that many of them have already entirely or partially reoriented their production toward alternative markets: the EU, Africa, Kazakhstan, China, the Middle East," said UniCredit analyst Perelygin. The impact of European products flooding onto the Ukrainian market remains unclear according to investment specialist Olexandra Brovko, with other analysts saying the effects of the deal will only be tangible in the long term given the current economic slowdown in Europe. "It's difficult to predict how competition will be established and what consequences this will have on Ukrainian producers," said Brovko, who works for a Ukrainian NGO that aims to facilitate business and investment in the country. Brovko added that the arrival of European products on Ukraine's would not necessarily dampen demand for Ukrainian goods. "It's possible that certain European products will find buyers and find a niche on the market where there are no competitors," she said. According to economist Olexandr Valchyshen of Investment Capital Ukraine, the free-trade agreement with the EU will boost investment in the country given the "very competitive" cost of Ukrainian labour.